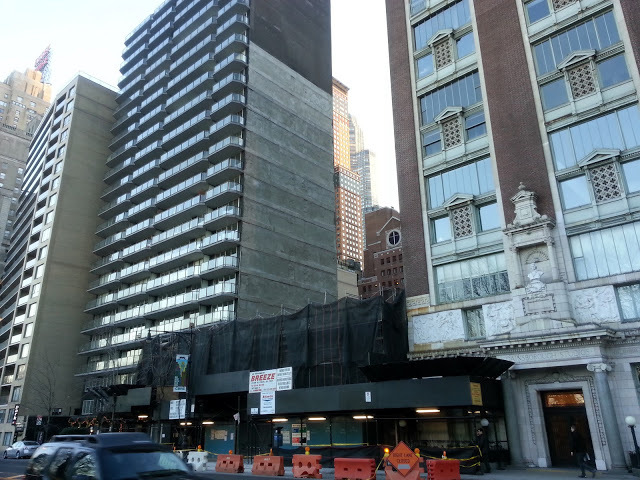 Demolition at 220 Central Park South is almost finished, although whether it actually does finish remains to be seen. The building is owned by Vornado, but the parking garage underneath is currently owned by Extell, so demolition can only be completed once Extell vacates. Extell has refused to sell, and if negotiations prove impossible, Vornado will have to wait til 2018 to fully demolish the structure. Extell’s Nordstrom Tower is rising directly behind 220 Central Park South, so the struggle is understandable. Even at 1,500 feet in height, views of Central Park from the lower floors of the Nordstrom Tower will be partially obscured by 220 Central Park South. The dispute has had no confirmed ending despite how far demolition has progressed. An earnings call from Vornado this past summer outlining “a bit of a tussle” as the reason for the hold-up. The project has (obviously) not yet had a public timetable released. The superior location and address of 220 Central Park South could make the project a contender to nearby One57, also by Extell. Robert Stern has been rumored to be 220 Central Park South’s architect, and his classical designs are some of the best in the city (see nearby ‘Limestone Jesus‘ 15 Central Park West, where the penthouse sold for $88 million last year). The following link at Curbed has a photo of 220 Central Park South as it stood prior to demolition, and you can see that it was nothing fantastic. If Stern is the architect of the new tower, the replacement is sure to be superior. Limestone Jesus eagerly awaits another architectural sibling.